At the moment GDPR is at the forefront of all our minds, with some great shared experience and learning from colleague in the NHS, charities and higher education. We have had a great presentation from Adrienne Mayers from the Liverpool Medical Institute about running exhibitions, which has inspired some of us to collaborate around NHS 70th and Health Information Week. Last year week shared innovative ways of running inductions with quizzes, use of 360 cameras and how to best get in contact with our new starters. Next up we are running a Teach Meet, with a focus on helping each other overcome our challenges. Meeting with Philip Cooke from Manchester Libraries in January was very informative, especially around their access to library services during hospital stays and home delivery service. Leaflets have gone out to a number of libraries to help promote the offers. The Spring Issue of LIHNNK up has been published and all libraries should have received their copy. A call for papers has been sent out for the summer edition: the deadline is the 8th June. We are in the process of trying to organise a WebEx meeting to discuss the future of the magazine, which is likely to take place in June. Under discussion will be plans to move to an online version. Thanks to Paul Tickner and Emma Child for completion of their two-years in the role of co-chair. Welcome to Rebecca Roylance and John Gale as new co-chairs. Knowledge management and Knowledge Café presented by Katie Nicholas. Yvonne Stubbington session on presenting at conferences. An update on technology developments and social media engagement at Cochrane. A presentation from Dr Hazel Rodham on facilitating online critical appraisal sessions for SLTs using Twitter. We have used the KfH Training Needs Analysis report to identify topics for future meetings. Topics identified include Knowledge Management, Project Management, Training and Presentation Skills, social media marketing and synthesising and summarising. As always thanks to all our hosts and presenters! 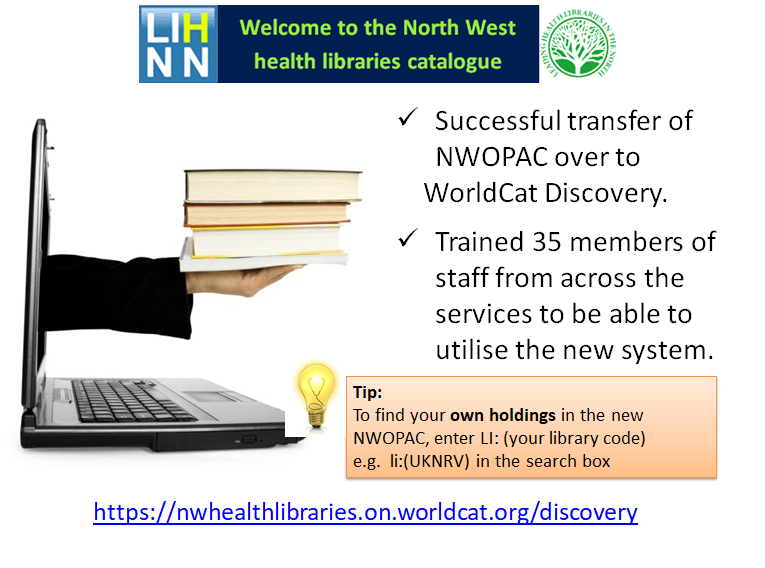 This entry was posted in LIHNN/HCLU Briefing and tagged Cheshire and Merseyside Patch Group, Greater Manchester Patch Group, Inter Lending and Document Supply Group, LIHNN AGM, LIHNN Clinical Librarians and Trainers Group, LIHNN Groups, LIHNNK-Up, Mental Health Librarians, NWOPAC Group. Bookmark the permalink.